Disabling prejudice: Athena Stevens’ play about the social politics of disability impresses on its revised return. Schism, Park Theatre. Photo: Stephen Cummiskey. How does a playwright communicate with their audience? If what the audience takes away from the play isn’t what the writer intended, whose fault is it it? Has the writer failed or has the audience misunderstood? And do the answers to these questions change when the artist is speaking as a member of a marginalised minority, to an audience that comes equipped with the privilege and preconceptions of the majority? I’ve got these questions running about my head. They aren’t really what Schism is about. But because – and this might have been a mistake – I read Athena Stevens’ foreword to her playtext before I sat down to watch the play itself, they’re the questions that have framed my thinking about it. Schism is the story of Katherine (Stevens herself), a young woman with cerebral palsy who becomes a successful architect; and it’s the story of Harrison (Jonathan McGuinness), the man who at first helps her get the education she’s being denied, and then tries to deny her the career he never achieved. And so on one level it’s an inspirational story of a disabled woman overcoming adversity and going on to a successful career. 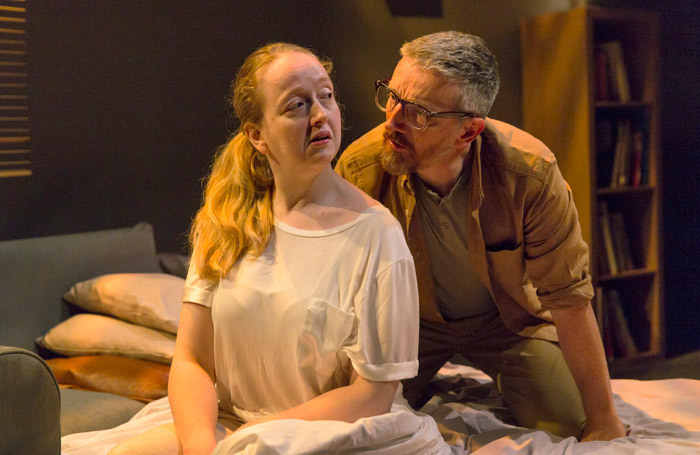 This is, apparently, how it was mostly received when it premiered at the Finborough Theatre in 2016 (“even if the play overstates the message that disability is no bar to ambition, it is propaganda in a good cause,” was Michael Billington’s verdict). And so the play has been revised, with an expanded role for Harrison as the narrator of the story, to put the focus back where, for Stevens, it should have been all along: how the biases and assumptions of the able-bodied, whether well-meaning or sinister, set the boundaries of what the disabled are allowed to aspire to, and the furious reaction when those boundaries are transgressed. In seven well-structured scenes charting the twenty years of their relationship, Katherine and Harrison move from teacher and student, to friends, lovers and finally exes, linked by the running commentary of an embittered, older Harrison, speaking into a tape recorder as he tries to set down his account of the selfishness and the monstrous ambition behind Katherine’s public persona. Making Harrison the narrator puts the focus squarely on how the able-bodied frame the stories of the disabled, in a way that isn’t necessarily subtle – at one point, Katherine tries to interrupt his narration, and Harrison literally tapes her mouth shut. But I guess Stevens felt she tried subtlety, and it didn’t work. The writing is sharp, funny, and intellectually engaged, dramatising complex arguments about disability effectively in the shifting power-play of the two characters without ever feeling like a dry debate. The performances, too, are both great, with Stevens as Katherine both charming and occasionally irritating in the way that driven, precocious people can be. And the design is evocative – a hazy room lit with flickering lights that reflect Harrison’s fluctuating mental state, until it starts to feel like the play is taking place inside his head. In some senses Schism‘s progression feels obvious: that Katherine will rise to overcome her mentor never really feels in doubt, and at points I wanted it to hurry up to the conclusion we all knew was coming. But mostly I was gripped. It’s a rich, smart, enjoyable production, and days later I’m still thinking about it. Schism is at the Park Theatre until June 9th. For more details, click here. Nathan is a playwright, youth worker and theatre practitioner in London. He was part of the Soho Young Company 2013-14, and was long-listed for the Writers Award there. His plays have been performed at The Roundhouse, The Bush, The Arcola, the Southwark Playhouse, and elsewhere. He's a founding member of Mouths Of Lions theatre company and co-Artistic Director of Right Mess.